Have you ever had a student with almost no words but you knew that they had a lot to say? These are the students that fascinate me the most. I desperately want to know how to help them communicate something. But where do I start? There are thousands of words that I could try to teach them; words that their typically developing peers are using. What are the first words that these children need to learn? Core words. According to AAC Language lab, over 90% of words that we use in spoken language are core vocabulary words. These are the words that you hear over and over: big, go, want, see, I. These words can be used in an environment and on any topic. These words vary somewhat depending on the age of the speaker as well as their developmental level. Praactical AAC has compiled a nice list of research and lists about core words here. Focus on one word for at least a week with hundreds of repetitions in the speech room, classroom, and at home. Integrate the core word into common core expectations by having a literacy component. Create a routine for teaching the core words. So, how do I combine these three needs? Teach core words according to the letter of the week! Now the letter of the week is transforming my core vocabulary instruction. Last year, I created a 26 part curriculum to teach 26 core words. Each word and activities correspond with a letter of the week. After going through the entire alphabet once, we went back and started over! It was incredible to see the progress that the students made when we focused so much on each word and then brought back words from previous weeks. What was even better than having a pre-made set of activities for each word, was the buy-in from the teachers! They posted the posters around the room and sent home the letters to parents. They went out of their way to use the core word of the week every day! Since I cannot be in those classrooms all day, it was fantastic to see the teachers carrying over the speech goals into the room. This program provides you with an easy to implement sets of activities, worksheets, and ideas focusing on CORE vocabulary for every letter of the alphabet. Core vocabulary is used for 94% of all the words spoken, and therefore most important vocabulary for all early language learners. Core vocabulary provides flexibility to request, comment, ask for help, and engage socially. It is the foundation for later language. With “Core Word and Letter of the Week”, you will use a systematic way to teach the alphabet and increase phonics skills. My teachers and I have chosen to teach the letters in alphabetic order, however, they could be taught in any order that works with your other curriculum. Because there are more weeks in the school year than letters of the alphabet, go back and start over after finishing the first round! 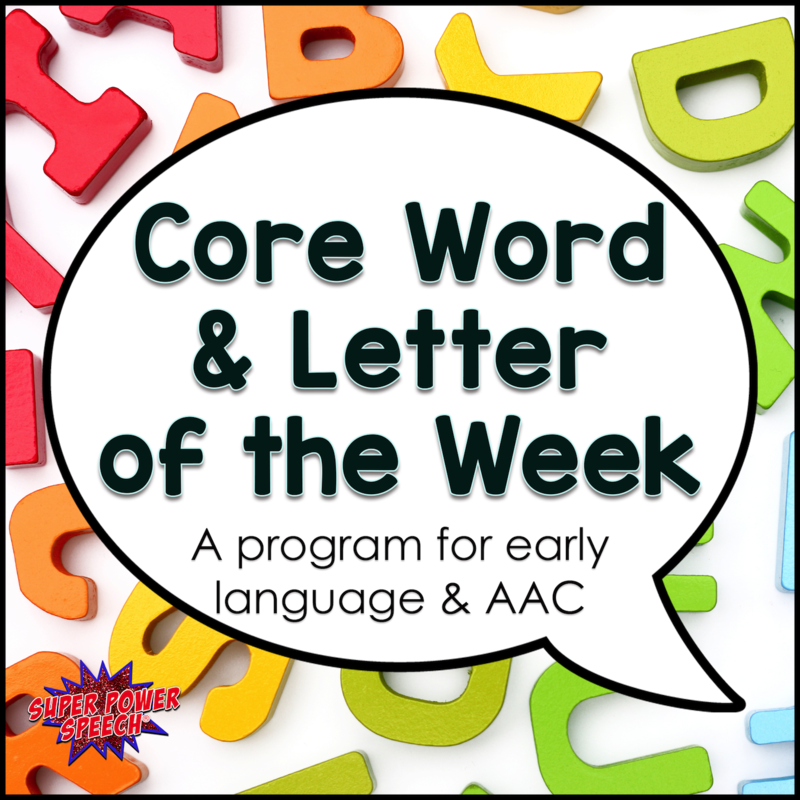 Get more information about “Core Word and Letter of the Week” by clicking here! Comment below and tell me if you use a systematic program to teach vocabulary with any of your early language learners? Hi! I love love your ideas of using letters to learn the alphabet, practice and teach core words by engaging kids to have fun & introduce literacy. And your affect is so enthusiastic that I want to be your student too:). The question I have about the kid who uses AAC ( LAMP). Completely nonverbal but real smart boy. His knowledge of icons is impressive but he needs to learn how to use them. Would you be using communication board or AAC itself to model or do activity? Thank you! 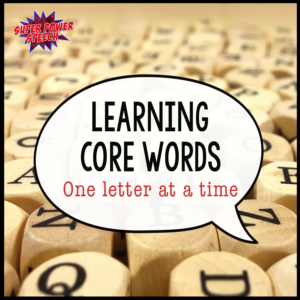 After you teach “all” during A week…how do you add that newly learned word to B week, if the lower core vocabulary stays the same? If it is not on the main communication board, I just keep reinforcing it verbally. Many of the words, however, are on the main board so it is easy to keep referring to when modeling language. Do you, by any chance sell the book of the week (like Benny’s Baseball)?